Staying in an Air B&B on Rimska cesta Ljubljana took us from our usual patch in the old town and led us to do what I enjoy most, exploring. As a special offer, a PDF of the Special Edition of Firsthand Guide to Bled is now available to download. 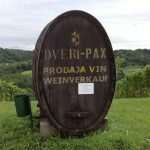 There are two places to enjoy wine tasting sessions in Bled and three major wine growing regions in Slovenia to drive through.